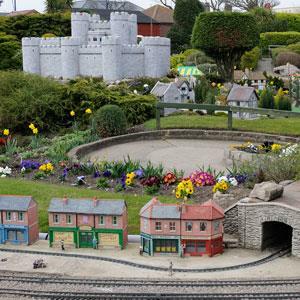 Educational Visits at Merrivale Model Village01493 842097work Educational VisitsOne of Great Yarmouth's best loved family attractions, set in over an acre of award-winning landscaped gardens with streams, waterfalls and lake with Koi Carp. Sit for a while, escape the hustle and bustle while you watch the Merrivale Railway go by and wonder at the models. The popular Old Penny Arcade is where you can hear the 'laughing sailor' and see 'what the butler saw', and not forgetting the Merrivale Tea Rooms, a favourite on the Golden Mile. New for 2016 - The Merrivale Eye! OPENING TIMES: 19 March to 30 October 2016, daily from 10:00 (seasonal last admissions). Evening illuminations daily from 27 July to 1 September 2016 & Wednesday 26 October 2016. Free preliminary visit for teacher. One of Great Yarmouth's best loved family attractions, set in over an acre of award-winning landscaped gardens with streams, waterfalls and lake with Koi Carp. Sit for a while, escape the hustle and bustle while you watch the Merrivale Railway go by and wonder at the models.